The Association of Progressive Muslims of Canada (APMC) is a cultural and social organization with a mandate of building bridges of understanding between all faith groups and serves the social, cultural and educational needs of the Muslim Community of Canada. It does so by organizing various events and undertaking projects to raise awareness and encourage dialogue and interaction. The organization aims to project a positive image about Muslims and promote the core Islamic values of peace, justice, respect, understanding and equality. The membership is open to Muslims 18 years or older from all denominations of Islam and from different ethnic and cultural backgrounds. 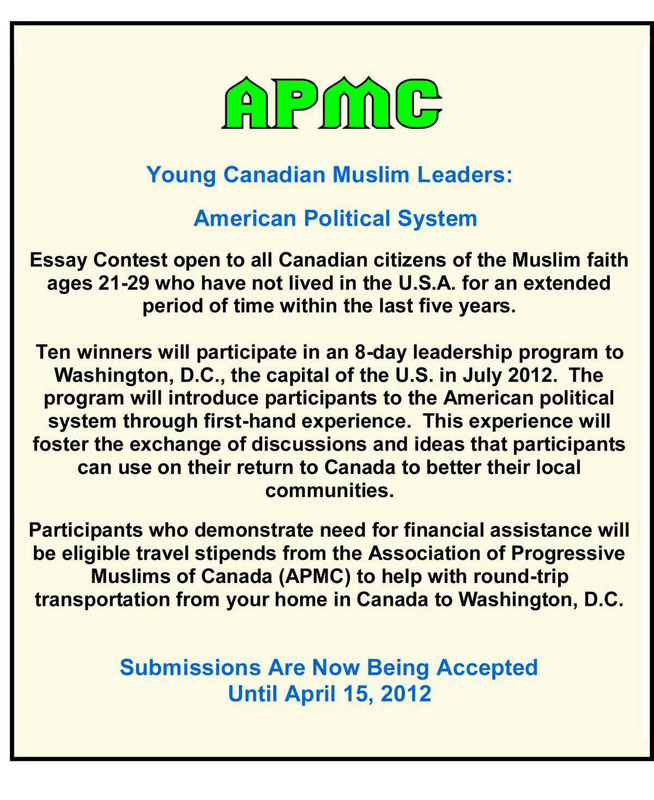 APMC is sponsoring this nationwide essay contest for Muslim youth 21 to 29 years of age who are among our best and brightest community movers and shakers in Canada who would like to learn more about the United States, and use what they have learned to improve lives in their communities. 1. The 8-day trip to Washington, D.C. will be coordinated in cooperation with the U.S. Embassy and will include a per diem. 2. Travel stipends are available to participants who demonstrate the need for financial assistance from APMC. Essay Question As a young Canadian Muslim interested in visiting Washington, D.C., what do you want to learn about the United States of America and the American political system, and how will you use what you have learned when you return to Canada? The deadline for submission of the essay is April 15, 2012. 1. Fill out the registration form. The information is very important, as your sponsor will be consulted should your essay be chosen as one of the top 20. 2. Attach a copy of an original work in English on the Essay Question, which should include a comprehensive list of sources consulted. 3. Submissions must not exceed two pages in length. Entries must be typed, double-spaced, in 12-point Times New Roman or an equivalent font with a one-inch margin on all sides of the page. 4. Do not place your name or your sponsor's name on any of the pages of the essay. Only the registration form should include this information. 5. Essays MUST be submitted in Microsoft Word (.doc or .docx) format. Essays submitted in any other format will not be considered. 6. Your essay will be disqualified if it does not meet the requirements or is submitted after the submission date of April 15, 2012. 7. Your essay will become the property of the Association of Progressive Muslims of Canada once it is submitted, and will not be returned. 8. Submit your essay and registration form electronically to as a packet info@progressivemuslims.ca. Please put APMC Study Tour Essay in the subject line. 9. If you have any questions, please email info@progressivemuslims.ca . 10. The decisions of the judges are final. YOU MAY COPY AND PASTE THE FOLLOWING APPLICANT INFORMATION AND SPONSORING ORGANIZATION'S INFORMATION IN A WORD DOCUMENT TO SUBMIT ELECTRONICALLY. To work towards making Muslims better understood by all.